Basic objective of this lecture is to presentation on Field Medical Card. Other objectives are prepared on any soldier who sustains wounds in the theater of Operations and designed to be used in forward combat areas by NATO troops. 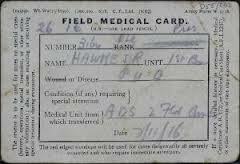 This Field Medical Card provides medical personnel where casualty is evacuated to with the information regarding basic information for Theater tracking purposes. This card provides medical treatment staff with an accurate, standardized record of the patient care initiated, prior to the patient’s arrival to the medical facility. Day Visit at National Centre for Control of Rheumatic Fever and Heart Disease.